Echinacea (ek-in-nay-shee-uh), Coneflowers, are not just purple coneflowers anymore, but a wide range of flower colorations consisting of various hues of magenta, orange, pink, purple, white, and yellow. There are also numerous flower types available including single, double, quilled, or cultivars with bi-color blooms or petals that changes color over time. Echinacea translates from the Greek as "hedge hog", referring to its prickly receptacle scales. Native to North American, purple coneflower was once common in meadows and prairies and is often used in summer gardens to attract butterflies or for use as a cut flower. Coneflowers like it sunny and hot. Plant in sun to partially shady sites. Morning sun and afternoon shade often yield the best looking flowers. Though they will tolerate light shade, fewer flowers will be produced and the plants will be weakened. 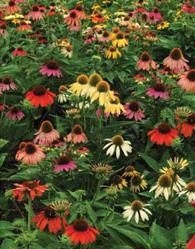 Light, loamy soils are best, but coneflowers will grow in any well-drained soil. Once established, they are quite drought tolerant. Echinacea are multi-stemmed plants with bushy, upright growth and large flower stalks that raise above the plant base. Most plants in the family grow about 2 to 4 feet tall and about 2 feet wide. 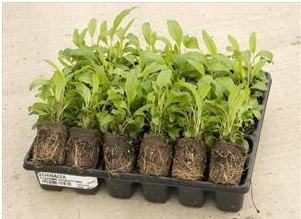 Dwarf and compact forms of Echinacea are available. Once established, Echinacea's thick tap-root will grow deep and is fairly drought tolerant. Use in mass or group plantings, borders, entrance ways, back of the perennial bed, and naturalized areas or woodland edge. Fragrant flowers attract butterflies. If deadheaded, the bloom cycle will be extended. However, some spent blooms should be left on the plants in fall because their seeds provide winter food for finches and other birds. The dried seed heads also provide interest in the winter. Deer resistant. MAINTENANCE: Keep plants moist but not overly wet until established. Flowering period may be extended by deadheading (removing faded blooms). Divide every 3 years, if necessary. Not all Echinacea hybrids grow true from seed, so consider removing chance seedlings. No serious pests or diseases impact Echinacea.PLANTING: Set plants 18 to 24 inches apart, in a sunny or lightly shaded location. Echinacea perform best with a rich, evenly moist, well-drained, organic-enriched soil, but will grow in average or poor soil.